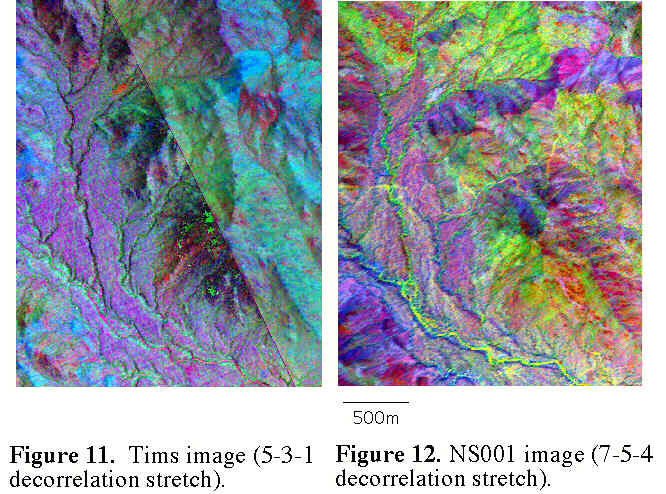 Both TIMS (Thermal Infrared Multispectral Scanner) and NS001 imagery were used in the mapping process. The TIMS imagery can be used to distinguish differences in silicate composition (figure 10), making it very useful for identifying lithologic contacts. Field mapping is still necessary to identify which lithologic contacts are important (such as rock unit boundaries) and to identify structural features such as fabrics and shear zones. The NS001 imagery was used to define Quaternary surfaces and the bedrock-alluvium contact. Images from both of these instruments have a resolution of around 5m, allowing them to pick up small scale variation in composition. Figures 11 and 12 show the same area with the TIMS and NS001 scanners respectively. Figures 13 and 14 compare the tims imagery to the geologic field map and spectral data from collected field specimens. Figure 15 is a image drape over digital topography of both the TIMS imagery and the geologic map.